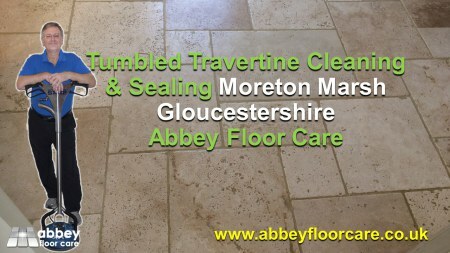 This Travertine Cleaning Moreton-In-Marsh project arose because the Travertine floors were soiled and dull. 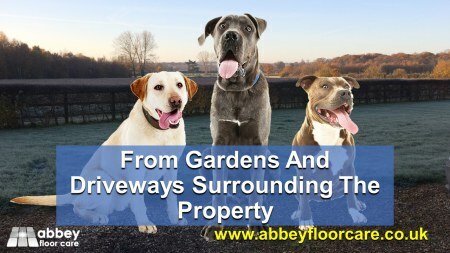 The soil came from three large dogs bringing in dirt and grit from the large garden surrounding the property. There were also some cracks across doorways. Tumbled Travertine tiles are a beautiful natural stone; offer a striking appearance to suit many properties. However, the natural holes in the tiles will trap dirt and grit. 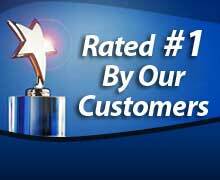 In many cases, the only way to restore the finish is to hire a Travertine Cleaning Professional. The homeowners also told me that they had used a variety of cleaning methods including bleach and a steam cleaner. 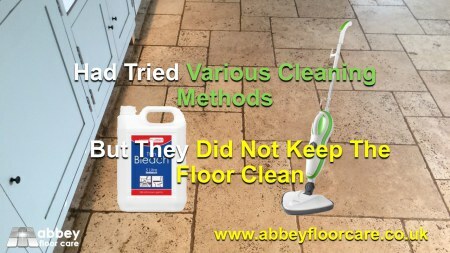 But their cleaning efforts made little difference to the floor. Natural stone should not be cleaned regularly with strong chemicals because the chemicals will damage the surface. Steam cleaners are also not ideal as they make the floor damp without removing ingrained soils and the heat from a steam cleaner can damage sealers. 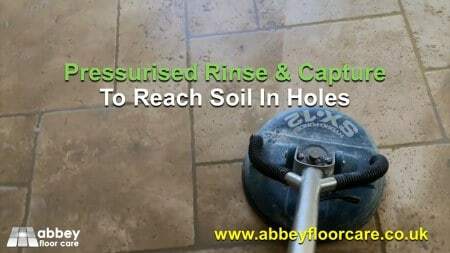 The project started with a thorough deep clean of the floor using a specialist Travertine Cleaner, which was allowed to dwell on the floor for an hour to help emulsify the ingrained soil. 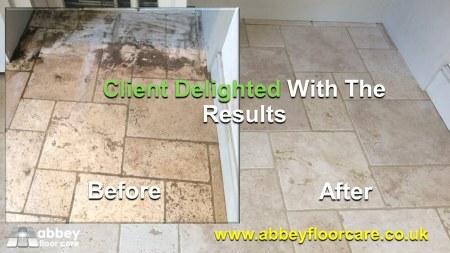 Once the cleaner had done its job, we used a rotary cleaning machine to release the soils from the grout. A lot of the holes in the Tumbled Travertine were too deep for the brush to reach the embedded soil. So we used our pressurised water rinse and capture equipment to clean the dirt out of the deeper holes. As you can see in the picture below, the cleaning made a significant improvement and lightened up the room considerably. The cleaning could not remove deep staining in the areas beneath the table legs. A number of different treatments and bleaches lightened the stains considerably, but we could not completely remove them. Before sealing the floor we repaired the cracks in the doorways. 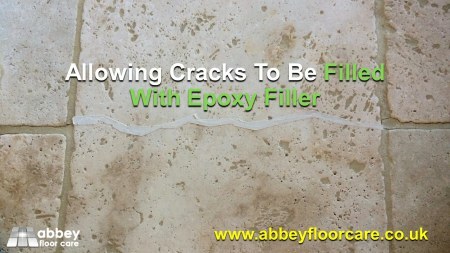 We opened up hairline cracks with diamond burrs, just enough to allow the cracks to be filled with jasmine epoxy filler. Once the filler had cured, we sanded it smooth to the floor. At the end of day one, we applied a single layer of water-based impregnating sealer. Travertine and grout can be porous, so the impregnating sealer acts as a primer for the finish sealer. Also, the impregnating sealer will protect the floor against any accidental spills from our client, while using the room in the evening. We advised our client to finish the floor with a surface sealer rather than an impregnating sealer. A surface sealer also protects the finish against abrasion from foot traffic and when an area shows signs of wear, it can be topped up again with a new coat of sealer. 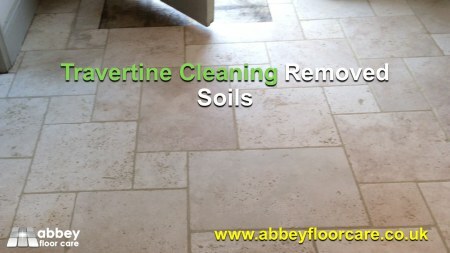 Also, the Travertine Cleaner contains a small amount of finish sealer, helping maintain the finish every time the floor is damp mopped. We applied six thin coats of mid-sheen surface sealer, giving the floor a lovely finish. Our client was over-the-moon with the appearance. 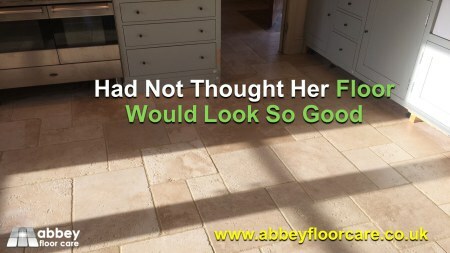 She did not think that her floor would ever look so good again. We gave detailed cleaning instructions and left a container of Travertine cleaner. We explained the importance of daily cleaning to help remove dry soil and maintain the finish on the floor. 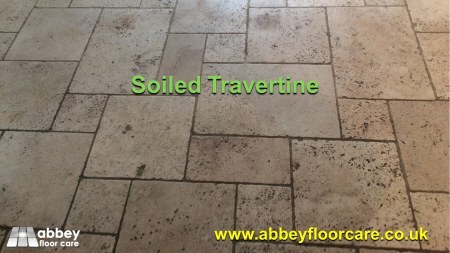 If you would like your tired, soiled Travertine floor to look like new again, click here for your free, no-obligation Travertine restoration quotation.